Variable or selection screen of BEx queries are important to gather user input for later data retrieval for the queries. Input fields on these screens are provided with so called input values or F4 values which help users to enter proper values. The proper values mean the one which exists in the systems and which makes sense for the report. Concept of F4 values was taken from classis ECC (former R/3) transactions where it was successfully used for years. Display - controls the format in which characteristics values will be displayed. Options that are available are: No display; Key; Text; Key and Text; Text and Key. Text Type - controls which format of text is displayed. Options that are available are: Default; Short text; Medium text; Long text. This also depends what types of text table is maintained for particular IO on tab Master data/text. If case "default" option is selected then the shortest text available is displayed. BEx description - Sets which description appears in BEx for particular characteristic. It is possible to choose between long and short description. Selection - Selection restriction for characteristics. It describes how values of a characteristic in BWx query should be restricted. In case of value "Clear for every Cell" or "Unique for every cell" characteristic must be restricted to one value in every column and in every structure for all the queries. The characteristic cannot then be aggregated. Query Def. Filter Value Selection - Selection of Filter Values for Query Definition. Determines how selection of filter values and restriction of characteristics function during query design time. 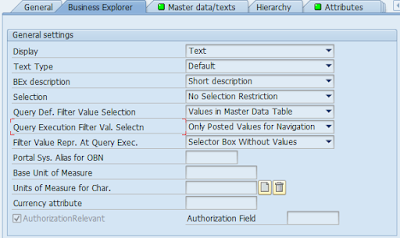 Normally values from characteristics master data table are displayed. 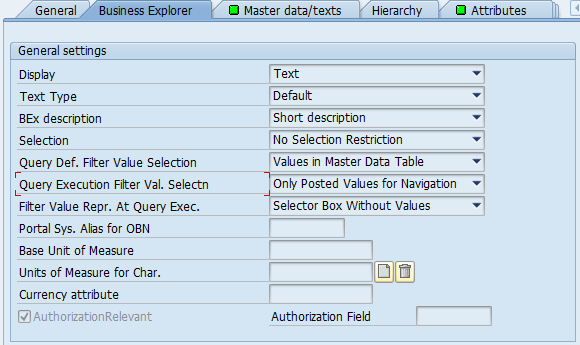 In case of characteristics without the master data table, the values from the SID table are displayed. Also it is possible to display only the values that are in the InfoProvider. This is available by giving option "InfoProvider Values Only". - M mode: Values in master data table. All available MD values are read to the MD tables (P table, Q table). - Q mode: Only posted values for navigation: Only those values that are part of the query results are read. - D mode: Only InfoProvider values. Only the values of the characteristics that are updated in the InfoProvider (IC dimensions or DataStore) object are read. This mode is valid for InfoCubes and DataStore objects - a case when MultiProvider only consist of IC and/or DSO. Exception is for the characteristics that are designed as Line Item Dimension - mode D is not supported here. In case M or Q mode is selected, there might a message "No data found" while selecting F4 during query runtime. Filter Value Repr. At Query Exec. - It determines how the display of filter values works when a query is executed. In some cases, it could be advisable to display the filter values with an appropriate control. If the characteristic has few characteristic values, you can display the values as a dropdown list box.